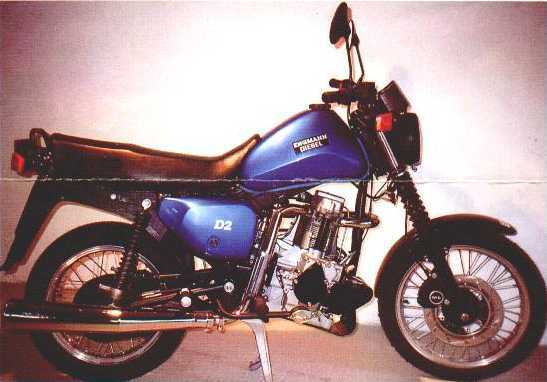 Now, sadly, no longer on offer, the Motorearth diesel motorcycle conversion kit that started at $2250. Originally priced at £9450 OTR,120 MPG - 110 MPH,Turbo! 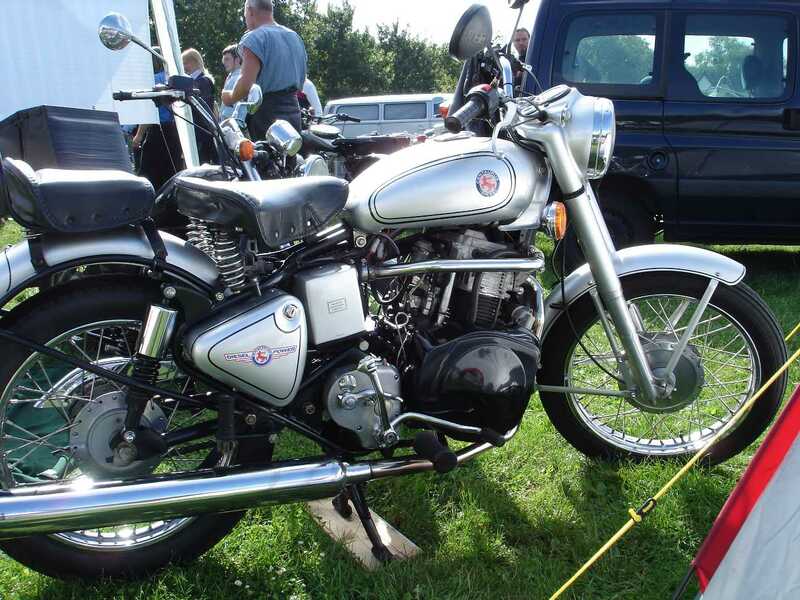 2010 saw the first appearance of the first British built common rail diesel motorcycle based around the Triumph Tiger or 'Steamer' as it is nick-named. The engine is a Mercedes Smart 800cc triple coupled with a six speed Ultima gearbox. The builder, Neil Laughlin, has recently returned from Nepal on this machine having given it a good shakedown in the process. Only two of these machines exist. The original contact page for the bike built by Neil contact page. In 1977/78 the French Department of Industry announced that the BFG consortium had won its latest and rather unique construction competition. 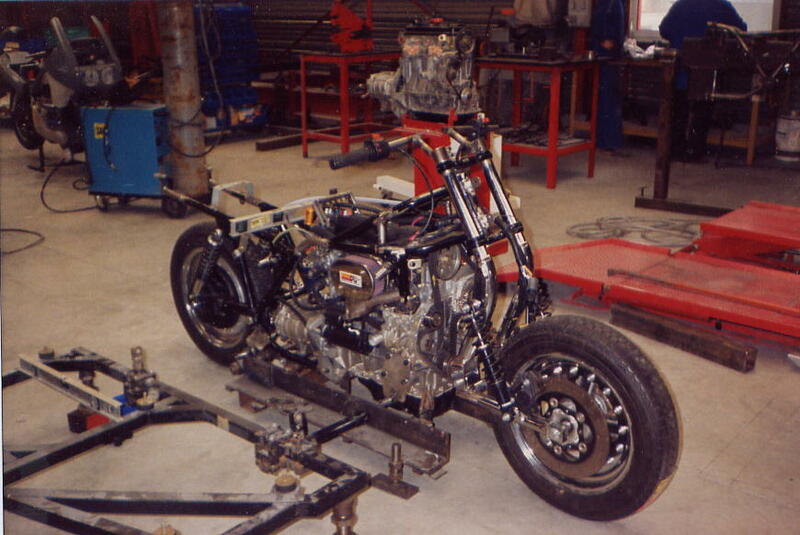 From the start it had been revolutionary in its thinking and aims - to put a car engine into a motorcycle frame. Louis Boccardo, Dominique Favario and Thierry Grange (the said BFG) were awarded the prize and set about producing upwards of 450 machines all of which contained petrol powered GS Citroen engines. Much was made of these machines and some even went into service with the French Police force. But there were problems and BFG ceased to make bikes. Boccardo then decided to build another bike in the same spirit and this was known as the MF. Using the engines of Citroen LN he made a small number of bikes but this venture also failed. Then he embarked on the manufacture of a small number of motorcycles using AX Citroen engine. Four machines were made but his greatest aim was to make Diesel Motorcycle so he fabricated a frame and inserted the diesel Peugeot engine from the AX Citroen. This prototype motorcycle was number "0". The picture below was taken by Yves at the factory where it was being made. Many thanks to Yves Claquin, owner of the pictured Diesel Boccardo motorcycle, for telling me the history of this amazing machine. The Diesel Boccardo owned by Yves Claquin. And here is the motorcycle complete with sidecar. (If anyone associated with BFG project, including Louis Boccardo, would like to contact me please do. Louis, if you read this why not come to the next Diesel bike rally? If I spot anyone wearing a turned up collar and dark sunglasses I'll assume it's you ;-) Anyway, I'm sure you would find many like minded people there and it would be good to see you. 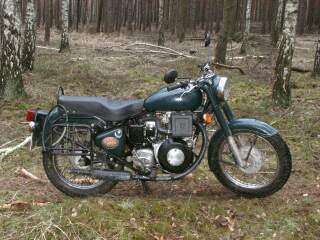 Engmann seem to have produced and offered several Diesel Motorcycles down the years, the MZ framed bike being the most prominant. 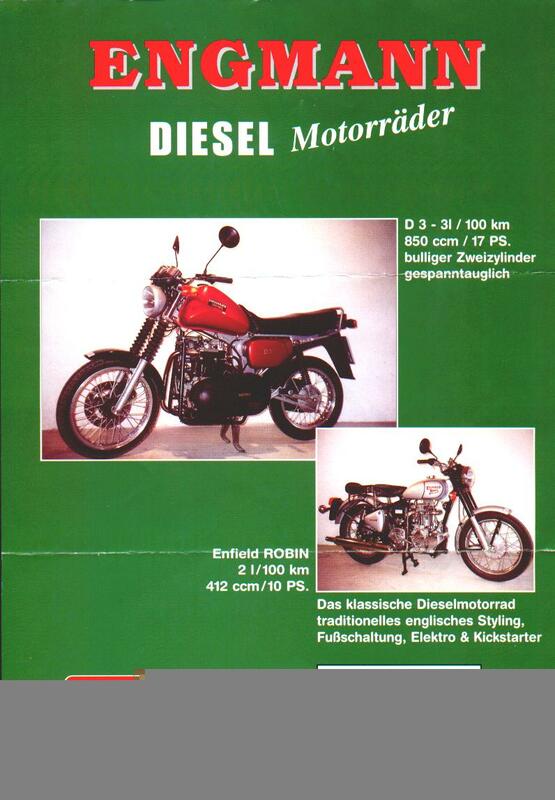 Click here and here to see different pages of a magazine advert (german text) offering both Ruggerini 850cc and Robin 412cc bikes. Notice that Engmann has tilted the Robin engine in an effort to reduce vibrations. Niether of these machines are still being made, Engmann having died some time ago. 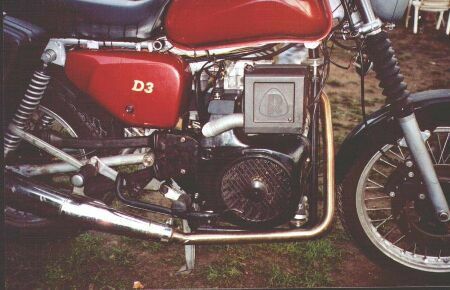 The D3 means the bike requires 3 litres of Diesel to travel 100 km. 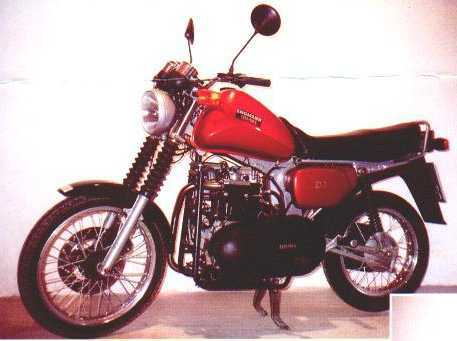 An MZ fitted with Fuji Robin engine. D2 means the bike requires 3 litres of Diesel per 100km. 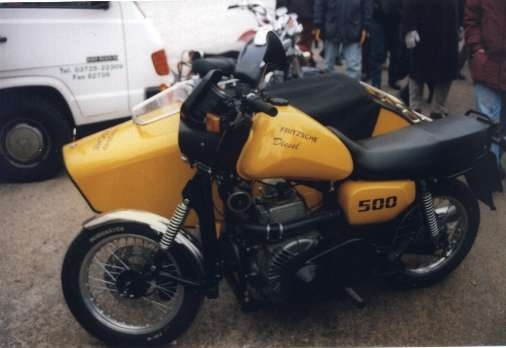 An MZ ETZ301 fitted with 850cc Ruggerini MD 191 engine and Variomatic Drive. Right side bike may not have Variomatic. 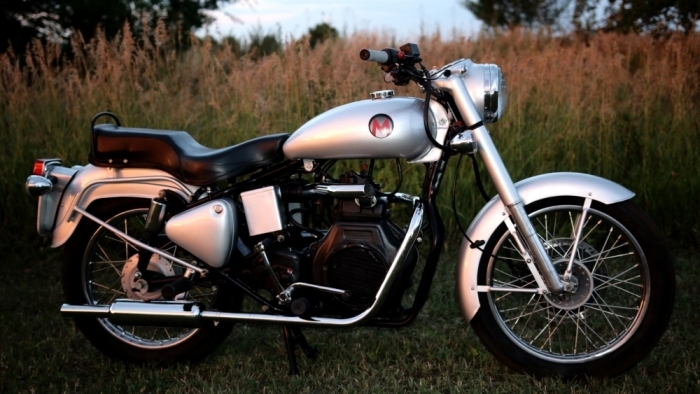 MZ Robin 412cc with Variomatic Primary Drive. 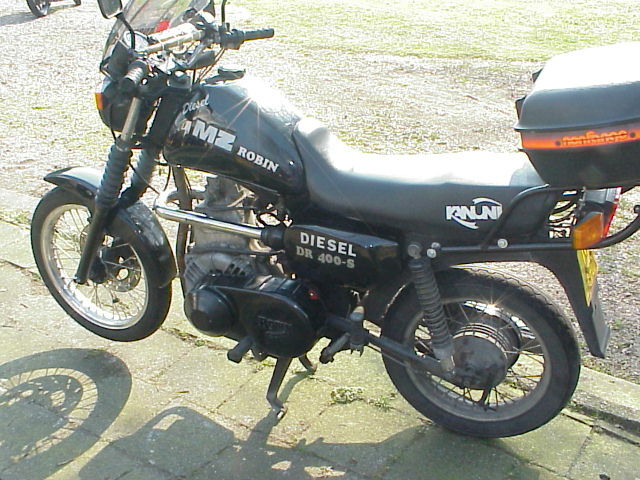 The MZ Robin DR400s 412cc single cylinder diesel with variomatic transmission is owned by William Hogervorst.With an engine producing 9.5 BHP Max speed is 55Mph. Only ten were ever converted by Robin and beyond that I know very little except that Robin also fitted thier engine into the Royal Enfield. I'm told some people do not like the Variomatic asspect of the machine, it being sometimes troublesome. Go here to visit William's own Diesel Bike site. MZ Robin - Only 10 were produced. This interesting machine appears, at first sight to be some kind of one off. Further investigation uncovers that it was produced by one Mr Fritzsche from Zwickau, Eastern Germany. 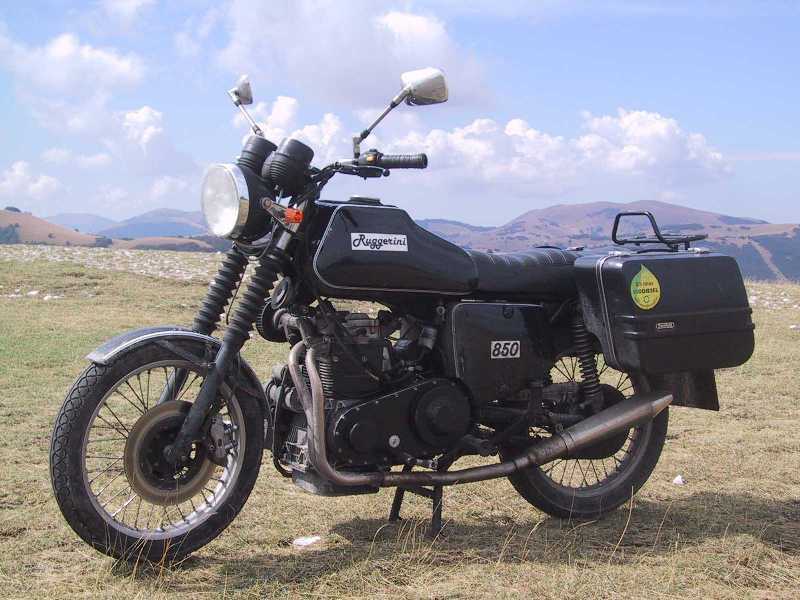 He has a small motorbike shop and also tried to produce a series of Diesel-MZ-conversion, but hasn't found an investor yet. Another sad story of someone with foresight but no backers. 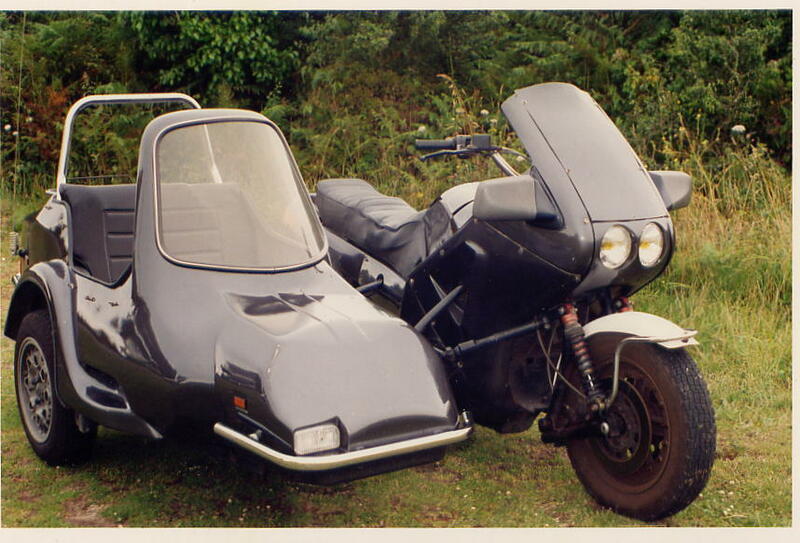 Again, it's an MZ, this time with a side car attached, but I'm not totally sure as to the engine. I am told Mr Fritzsche still builds customized Diesel MZs.Way to go. MZ Diesel with Sidecar. Low orders mean this bike never got off the ground. Reinhard tells me he first experienced this engine on a Variomatic bike and from then on decided to fit it to an MZ frame. He was not taken with the Variomatic part though and did not incorporate this. This bike is currently undergoing some repairs after an oil pipe fractured causing a piston seizure. Reinhard originally meant to make a small series of these bikes to sell. It is in this section because he is currently hard at work on a smaller machine which uses mainly belts instead of chains. Paul Holdsworth's ambition was to produce 200 of these machines a year but it is doubtful this target was ever met. 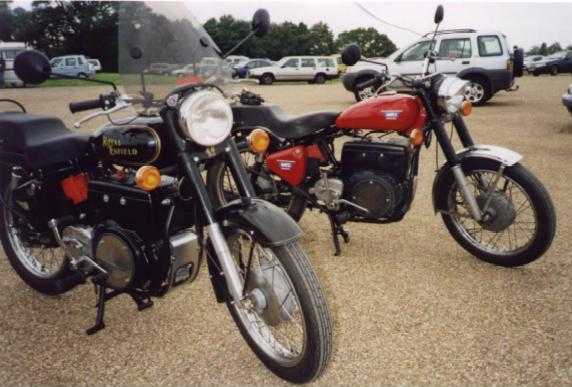 However, about 100 bikes were produced and sold at the rather expensive price back then of £4500, the engine costing £1500 of that. Production started after the legendary diesel enthusiast Ernie Dorsett approached the company after first producing 5 G3 Diesel Matchless machines. 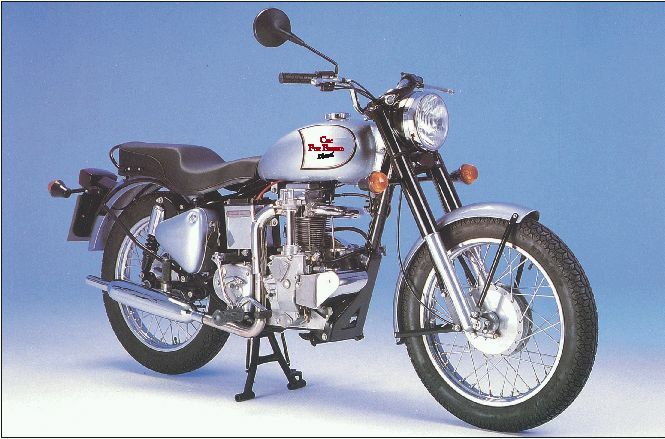 Problems procuring the Matchless frames led all concerned to turn instead to the Royal Enfield. 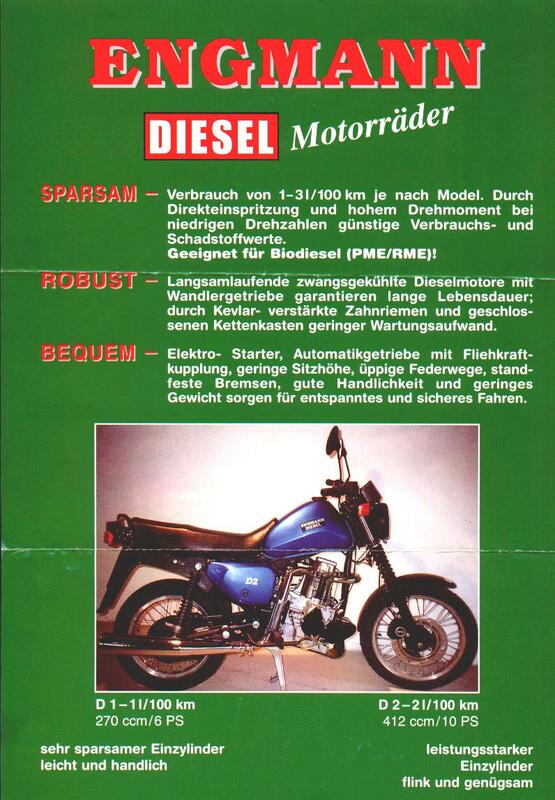 (Notice the error on the title photograph)Bikes began to roll off the production line in 1992. A big thanks to Dave who sends me this picture of a genuine Diesel Rokon. He tells me these machines are used by a certain mining company in Mexico. Bob from Rokon World tells me only about 20 of these machines were ever made. I've put it in this section because it was actually converted from the petrol, all be it by Rokon themselves. They (perhaps mistakenly) used the Hatz 1B20 engine and understandably were not overly impressed by its power output. Other's have used the 1B30 & 40 engines. 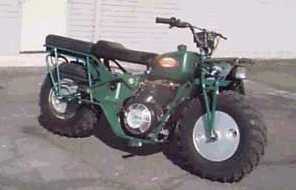 An American made Diesel Rokon motorcycle. Note: With the military so interested in Diesel powered bikes and given that the American and British Armies have used Rokon machines at various times one can only speculate as to why they never ended up owning any Diesel versions of the bike. I suspect the Rokons overall design meant it was never really suitable for the kind of things the army use bikes for, namely dispatch, and convoy work. The latest on this bike is that it is no longer produced because it alledgedly had some problems with frames breaking. Lets hope they overcome this. Charnwood, whilst still selling bikes, appear to be winding down their business by selling sidecar mouldings. This bike no longer be available as Charnwood now import the Sommer Bike. Enter the HATZ!!! Again we see the trusty Royal Enfield Bullet, this time fitted with a German made 350cc direct injection HATZ 1B30 Diesel engine. With 1:22 compression, electric start and good cold start performance this bike is just the thing if you aim to travel on the cheap with fuel consumption at 170 m.p.g. The engine produces 9 b.h.p. and is governed to around 3800rpm. New bikes retail at £4250 from CHARNWOOD CLASSIC RESTORATIONS. They'll even fit an engine in your old Bullet for around £1999. Can't be bad. See below for more contact info. 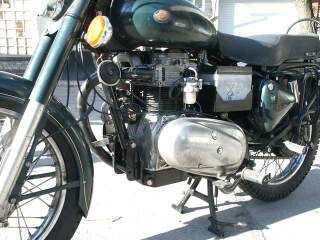 Trevor Williams Royal Enfield conversion help. The guys involved with this project sent me their website and I and happy to put it up here for all to see. Gaz offers his latest Diesel Bike creation! 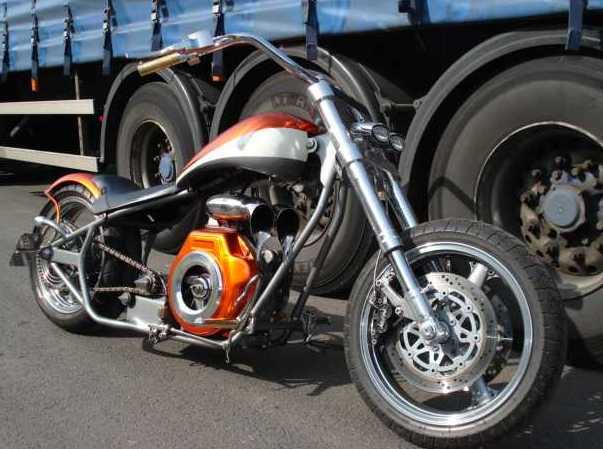 I am obliged to Tom for forwarding on some pictures of the latest chopper creation by Gaz's Custom Workshop. I am told it has a full MOT, does about 55-60mph and they will entertain offers starting at £4000. Professionally built by GCS Customs and winner of this years alternative category at the Bulldog Bash and winner of best engineering at The Rock and Blues Show, the only two shows that it was entered into. It was built to ride and not to be trailered to and from shows, cruises at around 55-60MPH and returns around 150 MPG. This is the second diesel bike that he has built and the other is still going strong and winning shows in Europe and even the USA. The photo session for BSH was held yesterday and it now has to go to make way for next years bike and give a little more room in the shop. It is for sale without reserve. ALL QUESTIONS AND APPOINTMENTS TO VIEW MUST BE DONE THROUGH THE SHOP PHONE NUMBER AND NOT BY E-MAIL. THE SHOP NUMBER IS 01283 813007 AND IS LOCATED NEAR BURTON ON TRENT. The specification is as follows: Frame: One off rigid with twin top tube and down tubes, drag style rear frame rails. Fully moulded. Engine and transmission: New 408cc Yanmar type diesel, one-off stainless exhaust and intakes, polished stainless bolts, one-off cowl trim, New Comet belt drive variable ratio transmission with one-off pulley covers and tax disc holder built into front pulley. One-off pillar block/ adjuster cover in stainless. Front end: Gsxr polished USD forks, ZXR400 wheel with polished rim, ZXR400 discs and calipers, one off spindle, modified Zodiac bars, modified Hi-Level risers, Zodiac lights, One-off brass grips, Zodiac internal throttle, Ness master cylinder with internal stainless brake line. 2 inch billet alloy yokes with blind top and fluted bottom yoke, stainless bearing cups, one-off brake splitter to stainless braided lines. Rear end: ZXR400 rear wheel and brakes, braided brake lines, polished alloy sprocket, one-off spindle, one-off rear light and plate mount. Stuff: Zodiac tank with flush fit cap, Le Pera bare bones seat, one-off rear mudguard and struts, Odyssey battery, one-off brass and alloy footpegs, one-off stainless brake lever, one-off brass brake fluid reservoir and a few spikes here and there! Unlike some bikes in the show this was ridden to the show with no no problems and has been of faultless service when in use. As for the parts used in the build, if it aint new then it has been rebuilt. 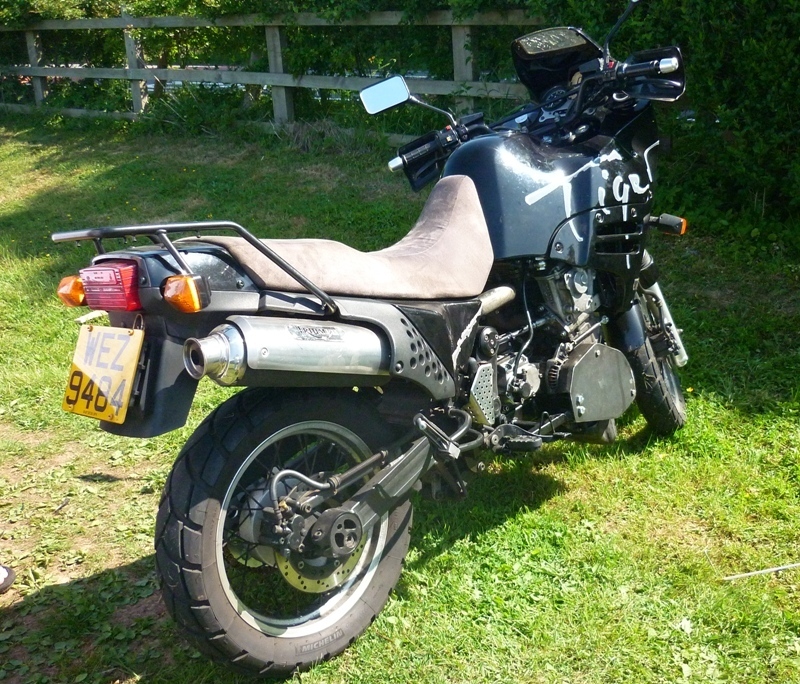 This bike is for sale locally and I reserve the right to remove it from sale prior to the end of the auction if a suitable offer has been made. To view or if you have any questions you can contact Gaz on 01283 813007 at the shop during business hours Delivery is possible for a pre-arranged fee. 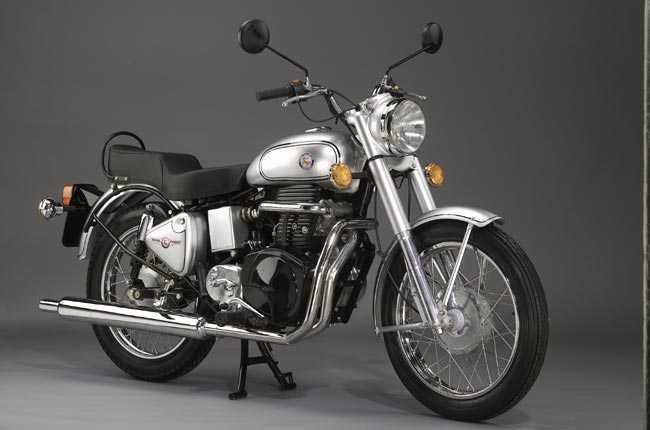 I have been told that CMC now build a Royal Enfield based machine to order. 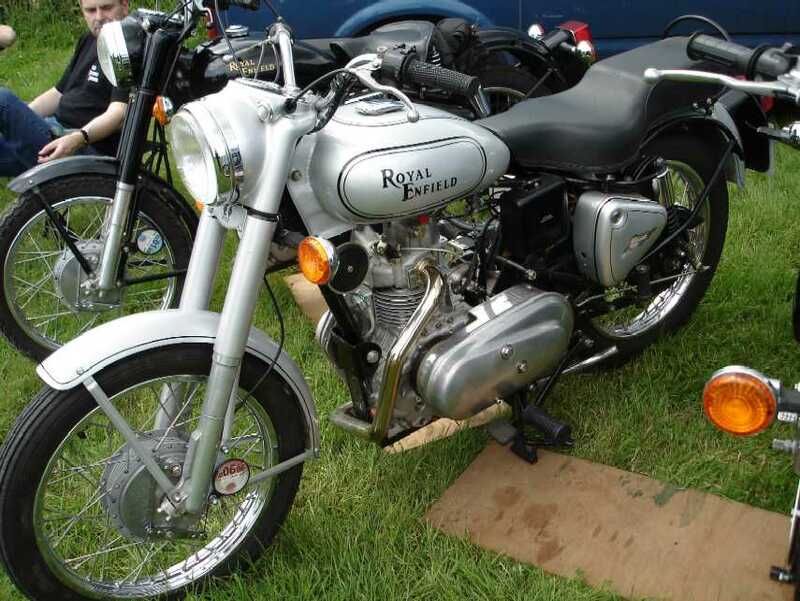 Its model Number is DY42D and it is available from Classic Motorcycles Ltd. You can phone them on 01728 833808. NOTE: These guys have gone out of business recently - sorry. Why not get a bike made to order? Not. This company stopped making bikes a while ago. I'm not sure if more than one was produced. Harold says,"I built a diesel Harley Fat Boy in 2000 and have had many inquiries since so I started my own company to produce diesel scooters in 2004. I have developed a new "square tube" frame. There are pictures on the website. I want to create an awareness for the diesel motorcycle enthusiast. I am using 3 engine packages: 2 cylinder V-Twin 750 cc, 2 cylinder inline 500 cc and a 3 cylinder 700 cc inline. Engines will be Yanmar. Their Address is: Vicious Cycles LLC, 10321 West Crane St. Cranesville, Pennsylvania. For more information go visit Harold Benich at his website. More here. Those familiar with Harold know he has a good track record producing these machines. See his Harley below. 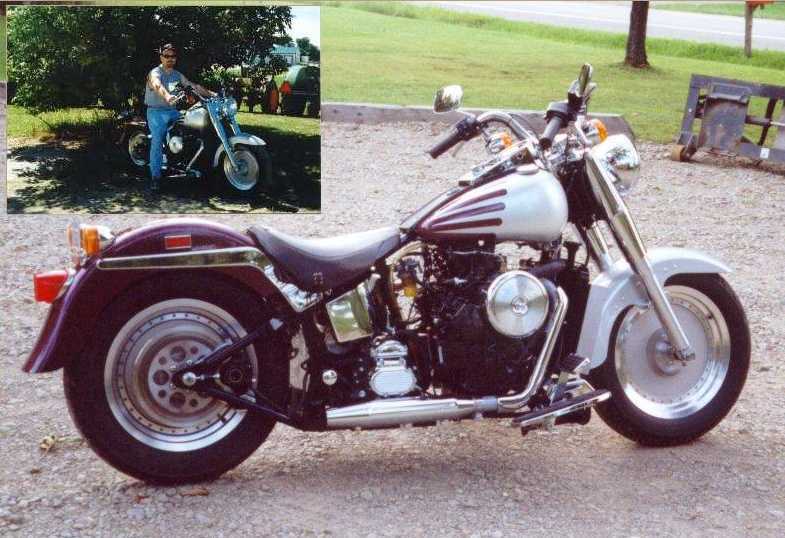 Harold's Harley FatBoy. Email him from his homepage above for more details.